Semi-porcelain is commonly referred to as “ironstone,” but it also goes by other names. Though the fired clay body does appear somewhat vitreous (glass-like), it is actually a refined earthenware and not to be confused with true porcelain. Porcelain clay is fired at temperatures above 1,300 degrees Celsius, and semi-porcelain, made from earthenware clay, is fired at around 1,200 degrees Celsius. A broken edge of semi-porcelain can be readily distinguished from porcelain. Staffordshire is the historic center of semi-porcelain (ironstone) production. By the mid-1800s, several Staffordshire potters produced ironstone because of the presence of high-quality clay within the district. 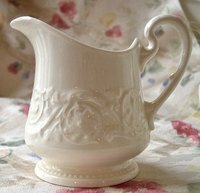 Americans quickly became consumers of semi-porcelain. After the Civil War, Ohio and New Jersey became the center of production in the U.S.
Semi-porcelain dishes are heavier and thicker than their porcelain counterparts (porcelain dishes are thin). Look for the terms, “semi porcelain,” “ironstone china,” “semi-vitreous porcelain,” “English porcelain” or other similar names on the maker’s mark. "National Museums Liverpool: Questions to a Ceramics Conservator"
"Trenton Historical Society: Marks of American Potters"